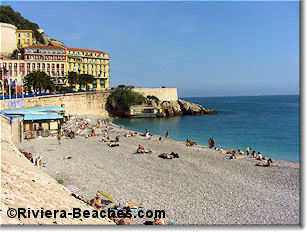 Castel is a public beach that also contains the private beach-restaurant Castel Plage. It's the beach furthest east on the Quai des Etats Unis, nestled under the Parc du Chateau. The public beach is wide and long but with large, less comfortable stones. Often the water is slightly calmer here as the promontory on the eastern end shields this beach from east winds. Castel beach is right under the luxury four-star Hotel La Perouse. Tucked into a corner of east Nice, Castel is a walk from a major bus stop. The nearest bus stop is Tour Bellanda where you can pick up line T32. There's no free parking nearby. The closest car park is the underground garage on the quai des Etats Unis, Parking Sulzer. 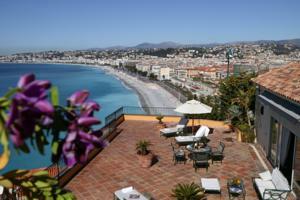 Choices are limited if you're not dining at Castel Plage beach restaurant. You can pick up picnic supplies and snacks nearby in Nice's Old Town. The nearest lifeguard is one beach to the west at Ponchettes. Castel Plage is one of the oldest establishments on the baie des anges but the owners have kept pace with the times nicely, with stylish and modern decoration. The beach lounge chairs are padded but do not come with a mattress. Because of its location, this is one of the more expensive beach-restaurants both in the daily rental fees and the prices on the menu. The restaurant is open late in summer but the atmosphere is quiet and romantic. 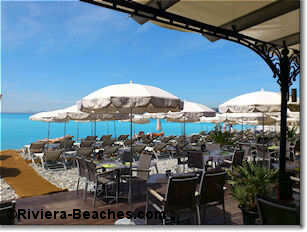 It is the most sedate beach-restaurant in Nice. See more about private beaches and beach-restaurants. Restaurant Opening Hours: April-September noon to 10.30pm with snacks only from 4 to 7pm. 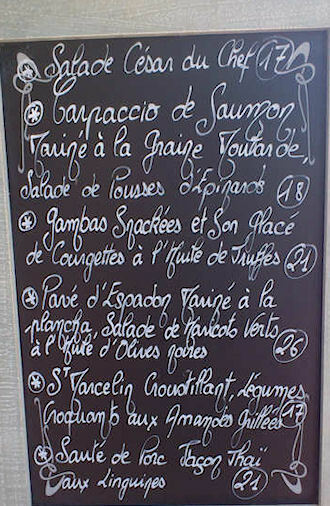 Restaurant Prices: Salade Nicoise €19, fish from €26, pasta from €16.